If you want to put real vintage valve tone at your toes, there’s really no alternative. In today’s crowded market, Effectrode’s unique valve-powered pedals have won it a place in some of the most revered signal chains in the world. Never one to stand still for long, Effectrode recently introduced a new version of its best-selling SR-71 preamp and a mouth-watering new product, the Leveling Amplifier. Today, we’re looking at the latter. As the name suggests, the Leveling Amplifier is a type of compressor. In recording studios, a leveller is a sort of crossover between a compressor and a limiter: it reduces dynamic range like a compressor and automatically amplifies the signal to make up for the reduced dynamics. They are often used on final mixes to add punch and make things more listenable. Like the SR-71, the Leveling Amplifier has three dual triode valves (on this sample, an optional trio of very expensive Philips NOS, available as an upcharge over the regular JJs while stocks last). The Leveling Amplifier’s controls will be familiar to anyone who’s used a studio compressor. There are three large knobs for peak reduction, gain and a footswitchable boost, which adds up to around 6dB when needed. Two smaller red pots govern the Attack and Knee, which influence how the Leveling Amplifier compresses the signal, making it subtler and more transparent if needed. The Leveling Amplifier features a transformer-isolated balanced output, for the best direct-to-desk quality. On the back edge, together with in/out and remote switching jacks, there are two small toggle switches, one to set the basic operating level at +6, +12 or +18dB, the second to activate Dynamic EQ. The Leveling Amplifier is super-quiet and transparent, adding a subtle warmth, with enhanced clarity at lower settings. We tried it on a variety of instruments with impressive results, particularly on a lap steel, where the Effectrode added sustain and evened out the results of some less than perfect picking to give a very pro-sounding recording. Like all Effectrode products, this new pedal isn’t cheap, but it’s unique and superbly made. 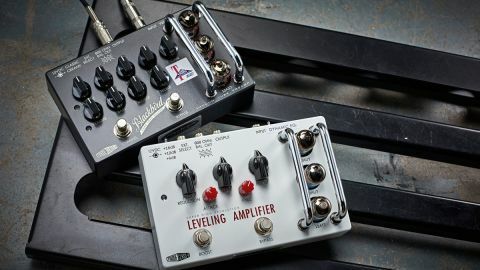 The Leveling Amplifier is highly usable and sounds better than some high-end rack comp/limiters, giving it a potential home in many project studios as well as pedalboards.